This common name refers to only one family. These are pretty much always called Saddle-case Makers. This family is one of the primitive caddisflies of the Rhyacophiloidea superfamily. However, they are not free-living like their better known cousins the Rhyacophilidae (Green Rockworm). Instead they build rounded "turtle" shaped cases that do not surround the larvae but are rather attached to the rock surface at their margins. Underneath is a sling made of secretions upon which the larvae ride, hence the common name Saddle-case Makers. There are four genera of possible interest but only one is generally recognized as important to anglers. See Glossosoma (Little Brown Short-horned Caddis) for details. The other three are so tiny that they are also called Pseudo-microcaddis. 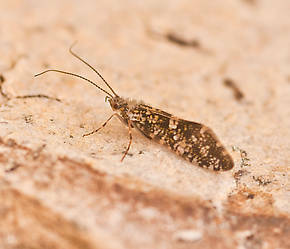 Protoptila (Tiny Spotted Short-horned Caddis) is rarely important in trout streams and is generally found in warmer, larger water than the other two genera. Agapetus (Tiny black Short-horned Caddis) is quite common in many northern streams. Matrioptila is an extremely tiny southern genus. Larvae: Many classes of aquatic insects, such as caddisflies, midges, craneflies, dobsonflies, alderflies, and many more, are known as "larvae" rather than "nymphs" in their juvenile stages. They have mostly soft bodies rather than hard exoskeletons. These insects also advance through a "pupa" stage before reaching adulthood.